In this 3rd Newsletter of this year we are looking back and looking forward. We share impressions of the great Conference in June in Bogota and we introduce some new initiatives. 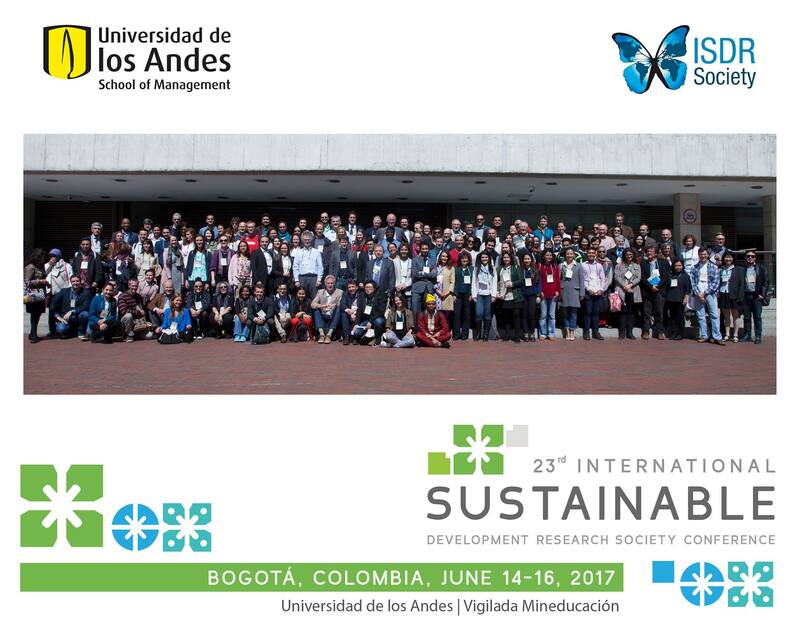 More than 330 participants enjoyed the 23rd ISDRS Conference this year, on the hill sides of the Cerro de Guadaloupe (3317 m) in the city centre of Bogotá, Colombia, close to the old city centre La Candalaria. This historical environment served as a perfect place to reflect the challenges of inclusive development, especially in the context of post-conflict developments in Colombia. What resilience is, is what can be seen here in practice, recovering from a dark and violent period. We had the special honour to be addressed by Colombia’s President and Nobel Prize winner Juan Manuel Santos, who shared with us his fruitful efforts to combine sustainable development approaches with the peace process aiming for revitalisation of previous conflict areas. His speech can be seen here. 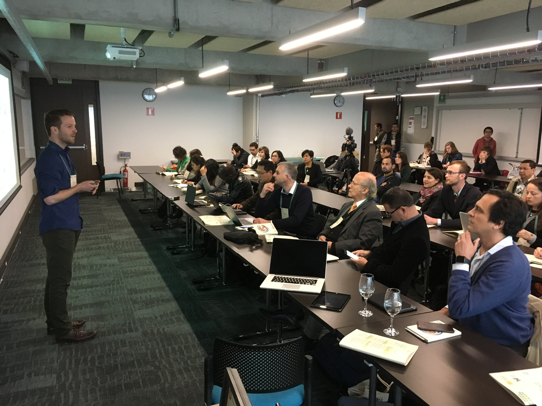 We had many deep discussions and examples of projects in the Latin American region, some of the discussion are available online on our Facebook site here. We are very grateful for the superb preparations by the team of Prof. Eduardo Wills, making this conference such a great success. I will long remember the local music and dances during the conference dinner. During the conference, the ISDRS Board discussed various plans for new activities of the Society. Amongst these is the ambition to further develop the currently small number of (what was previously called) ‘thematic working groups’ into new “topic groups”, which are closely related to the UN Sustainable Development Goals (SDG’s). Our former groups do actually cover many of the SDG’s and this is now also visible on the website, showing the new structure. However, this is work in progress. For most of the topics, individual board member are initiating activities, but we do explicitly call all our members to connect their own work to these topic groups. The webpages are intended to provide a platform to shared your work on any of the topic groups, to call for collaboration or the engage in discourses about the current state-of–art in these fields and to suggest ways forward. We also intend to link to other organisations who are active on the various fields, especially for topics which did get less attention in our activities in recent past. Can and do you want to contribute in this: please let us know! Another new initiative relates to our role as a central knowledge hub on research in sustainable development. To strengthen this role, starting next year we will identify and honor the best research article written every year with an Award. With this we intend to further stimulate solid research, especially if it supports introduction of solutions to our immense sustainability challenges. We will work with a participatory approach: everyone connected to the ISDRS can suggest nominations for such a ‘best research article’. Read more details about it in this Newsletter. We invite you to look for candidate journal article already. Looking forward further we are happy to introduce next year’s 24th ISDRS Conference taken place in Messina, Italy in the week of 13-15 June 2018. Like before, we will also have a PhD workshop and sustainability excursions connected to the program. Read more about it in this Newsletter. The ISDRS serves as a central knowledge hub on research in sustainable development. To strengthen our role, starting next year we will identify and honour the best research paper written every year. With this we intend to further stimulate solid research, but also their applicability to support introduction of solutions to our immense challenges. We will work with a participatory approach: everyone connected to the ISDRS can suggest nominations for such a ‘best research article’. A Jury with decide on a short list of nominated papers and after that again ISDRS members will vote to select the best article. The winners will be honoured during the 2018 ISDRS Conference in Italy. Early next year we will invite all our members to come with suggestions for best articles and further explain the procedure. If you have been an ISDRS Green Member for two consecutive years, you have the right to vote in the ISDRS Board Election 2017. If you haven't received an email already, and you are eligible, please contact us via assistant@isdrs.org as soon as possible. This important academic Congress took place at the Management School in Universidad de los Andes , Bogotá-Colombia during June 14th to 16tt, 2017. The Conference was a huge success. 466 research presentations including 106 posters were discussed by professors and Phd students from 54 countries in 33 tracks. The Congress was inaugurated by Colombia´s President Juan Manuel Santos who spoke about the importance of the Sustainable Development Goals. Uniandes Rector presented how the University approaches sustainable development issues. Walter Vermeulen highlighted the importance of having this conference for the first time in Latin America. Key Note speakers from Northern Ireland, The Netherlands, United Nations, Colombia and Peru gave interesting conferences. A special Art exhibition about sustainability issues in Bogotá and its surrounding region provided the opportunity to engage participants in the discussion of how to approach these issues. Participants showed a huge enthusiasm and commitment of being present in this megadiverse country and city and expressed their satisfaction with the great organization and research discussion of the Conference. In the 23rd ISDRS Conference in Bogotá our track included 13 presentations with inputs from various parts of the world. Privately led instruments for introducing sustainability in value chains have become more present and diversified in recent years. In our sessions authors explored these different types of instruments, with particular emphasis on business-to-business models. Cases of direct trade and social enterprises, in which manufactures engage directly with suppliers, offering a higher share of the value, were discussed. Interestingly, these examples are still supported on third-party certification, explicitly or implicitly. Individualized strategies have extended their aim at producing not only economic value for providers and businesses but also social and environmental value, as the examples of collaboration and symbiosis among companies demonstrate. In spite of progress, these individualized strategies still struggle to produce scalable results. In many cases companies reach only a small percentage of providers, highlighting the role of broader, landscape-scale initiatives that engage multiple actors, including the state. Examples of these new actors and their roles were given in the cases of REDES program in Colombia and the School of Textiles in Germany. In both cases universities are playing a key role providing tools for learning, developing capabilities and increasing trust among participants. Assessing the impact of private sustainability instruments presents several challenges, from access to information to robust and credible counterfactuals. Some of the presenters showed data towards this end, highlighting how value is distributed among actors in the network and what types of benefits are produced. Most of the work on value chains has been done in the upstream part of the chain. Evidence was presented on inclusive distribution and its impacts on low-income female heads of household. The discussion then centered around the challenges for introducing sustainability in the context of emerging economies where the state and civil society organizations need to help raising awareness about these issues so consumers demand and companies scale up their efforts for a sustainability transition. It was a premier. Both tracks were held the first time together, mixed within two consecutive sessions. Presenters came from North and Latin American as well as from European and Asian universities. The range of “home departments” was wide. This reflected the horizontal relevance of the two track topics. Nine presentations provided a multifaceted picture with numerous “scientific cross-fertilizations”. The auditorium was even broader in the geographic range and included also people beyond academia. Its lively discussion contributions highlighted interconnections and complementarities. • Stronger focus on education and culture: how education can shape culture to behave in a climate friendly way? • the extent of opportunities for public participation that are available to different subnational stakeholders. • Comparative research across and within continents on the effectiveness of Public Participation in terms of access to information, administrative procedures and justice. The 24th ISDRS Conference will be held in Messina, Italy, on 13th to 15th of June. The theme of the conference is 'Actions for a Sustainable World: From Theory to Practice'. We are enthused to announce the website has been launched and preparations are well underway. Please visit www.isdrsconference.org. Or watch the amazing promo here. The end of the Cold War raised great hopes for a peace dividend, that disarmament could release the huge resources in the military-industrial complex. The focus shifted towards conversion of the military arsenals, and the growing need to address environmental problems. Both together led to the idea of transforming science and technology from the arms races towards environmental purposes (UN 1991; Scheffran 1992). However, subsequent attempts to include peace-related issues in the 1992 Earth Summit in Rio de Janeiro failed, the processes and discourses on security/peace and environment/ development fell apart, and the opportunity for a peace dividend was missed, leading to today’s world of crisis, instability and conflict. While a non-peaceful world undermines the conditions for sustainable development, a non-sustainable world contradicts peace-building. The discourse on the relationship between sustainability and peace has been revived in wake of the Sustainable Development Goals (SDGs) which explicitly made peace one of its goals, with a number of specific sub-goals (see table). One of the indicators is the number of state-based armed conflicts which after a drop from more than 50 in 1991 to about 35 around 2005 has increased since then to more than 50 in 2015. The number of non-state based conflicts has grown more dramatically to more than 70 (UCDP 2017). Accordingly, the number of casualties from armed violence has increased by a factor of six between 2005 and 2015. A few high-intensity armed conflicts have caused the largest numbers of casualties, in particular the conflicts in Syria, Afghanistan and Iraq. On the other hand, the rate of homicides has declined over the past decade. In 2015, between 5.2 and 6.7 persons per 100,000 persons worldwide became victims of intentional homicide where people in some countries in Latin America, sub-Saharan Africa and Asia face increased risk of intentional murder. More citizens around the world have better access to justice, although progress, together with effective, accountable and inclusive institutions, remains uneven across and within regions (SDGs 2017). After a period of disappointed hopes, we now live in a highly unstable world where complex conflicts combine with new environmental and climate risks, arms races and wars, even the possibility of a devastating nuclear war (Scheffran 2008; 2017). Numerous factors and actors became interrelated in cascading crises that spiral out of control, including September 11, economic crises, the Arab Spring, wars in Iraq, Afghanistan, Libya and Syria, civil war in Ukraine, the Greek debt crisis, the European refugee crisis and terror attacks. These events are interrelated through multiple channels, global connectors and chain reactions triggering tipping events beyond thresholds. These include natural disasters, stock market crashes, revolutions, mass exodus or violent conflicts. Possible reactions to a world of ever growing complexity are over-simplifications, religious, populist and nationalist fundamentalisms, rhetoric against science and intellectuals, or resistance against globalized structures. Environmental change is connected with other problem areas through multiple linkages from local to global levels, leading to a nexus of environmental degradation, climate change, poverty and hunger which affect the living conditions in many parts of the world and undermine security. Climate change is considered a risk multiplier, which disturbs the balance between natural and social systems and amplifies the consequences. Key pathways can potentially affect the functioning of critical infrastructures and supply networks; intensify the nexus of water, energy and food; lead to production losses, price increases and financial crises in other regions through global markets; undermine human security, social living conditions and political stability; and induce or aggravate migration movements and conflict situations (Scheffran 2016b). Without sustainable and peaceful solutions the world may continue a downward spiral running into the boundaries of the Anthropocene, including finite natural resources and limits to growth; ethical, social, political and legal constraints; limits of scientific knowledge and uncertainty. The challenge is to anticipate and avoid risky pathways and stabilize human–nature interaction in an increasingly interconnected world by counteracting forces that slow down and change course towards a more sustainable, peaceful and viable world, allowing for a timely and self-organized transformation that takes the limits of the Anthropocene into account. Human behavior and societies are not condemned to mechanistically follow disastrous pathways, but also have the ability to cope with problems like climate change and develop alternative pathways. To succeed, human responses and actions need to be timely and adequate compared to the speed, intensity and complexity of change. Concepts of anticipative and adaptive governance are needed to influence critical decision points and adjust actions to protect human security, strengthen societal resilience and sustainable livelihoods. The challenge is to develop collective adaptive strategies and capabilities to drive the planet through the complex and foggy landscapes of the future where information is limited and uncertain, but continuously updated. Sustainable development balances economic, social and ecological issues for present and future generations and integrate the human socio-sphere into the boundaries of the natural eco-sphere, while managing the ambivalent dynamics of the techno-sphere. This includes exploring common linkages between sustainable development and peace. Both combine similar goals: preservation and protection of natural resources and human existence against destruction and violence as well as the unfolding of abilities and development opportunities. A third task includes the shaping (Gestaltung) of a viable world to a proper form or design. The aim is to move from the vicious cycle of growth, power and violence to a virtuous cycle between sustainability, development and peace. This approach is compatible with a multi-level-perspective of socio-technical transformations between regimes, niches and landscapes. There is wide range of strategies for sustainable peace, including climate mitigation and adaptation; the cultivation of diversity, flexibility and justice; the building of social networks to facilitate the exchange of knowledge, income and other resources; new capabilities to manage disasters; arms control, non-proliferation and disarmament; regional security concepts, crisis prevention, conflict resolution and confidence-building; as well as innovative institutional frameworks and legal mechanisms. The 2015 Paris Agreement on climate change and the 2017 Treaty for the Prohibition of Nuclear Weapons are hopeful signs for a new world order based on international law and cooperation. While the scope and effectiveness of these measures may not yet be sufficient to eliminate the nuclear and climate threats (Scheffran et al. 2016), they could lay the foundations and attract political support from local to global levels for a sustainable and peaceful transformation towards governing the Anthropocene in the common house of planet Earth, where humans live together with other species and nations favor cohabitation rather than confrontation. Scheffran J (1992) Environmental Applications of Military Information and Communication Technologies. In: Brunn A, Baehr L, Karpe HJ (Eds.) Conversion: Opportunities for Development and Environment, Springer: 122–133. Scheffran J, Burroughs J, Leidreiter A, van Riet R, Ware A (2016) The Climate-Nuclear Nexus. World Future Council (https://www.worldfuturecouncil.org/the-climate-nuclear-nexus). Scheffran J (2016b) From a Climate of Complexity to Sustainable Peace: Viability Transformations and Adaptive Governance in the Anthropocene, in: Brauch HG, Oswald-Spring U, Grin J, Scheffran J (ed.) Handbook on Sustainability Transition and Sustainable Peace, Springer, 305-346. Scheffran J (2017) Complex Crisis Landscapes and Climate Risk Governance: Challenges for European Stability and Transformation. Policy Insights, EUC Paper Series, Special Issue - Governing Globalization. UN, 1991: “Potential Uses of Military-Related Resources for Protection of the Environment”, Report of the Secretary General, Office for Disarmament Affairs New York; at: <http://www.un.org/disarmament/HomePage/ODA Publications/DisarmamentStudySeries/PDF/SS-25.pdf>. UCDP (2017) Uppsala Conflict Data Program, Department of Peace and Conflict Research, http://ucdp.uu.se.